The SSB connector is a versatile strut connector that is commonly used at the bottom of a steel beam to accommodate large standoff conditions. It accommodates 1" of upward and 1" of downward movement. Use the specified number of XLSH34B1414 #14 shouldered screws (included). Install shouldered screws in the slots adjacent to the “No-Equal” stamp. Use a maximum of 1 screw per slot. If the SSB intrudes on interior space, it can be trimmed. The trimmed part shall allow an edge distance from the center of the nearest anchor to the end of the trimmed part of 1/2" or greater. Submittal/substitution request for the SSB bypass framing slide-clip strut connector for cold-formed steel construction. When the SSB connector is used with two shouldered screws, the screws may be installed in any two slots. Allowable loads are based on clips installed with (3) #12-24 screws in the anchor leg. 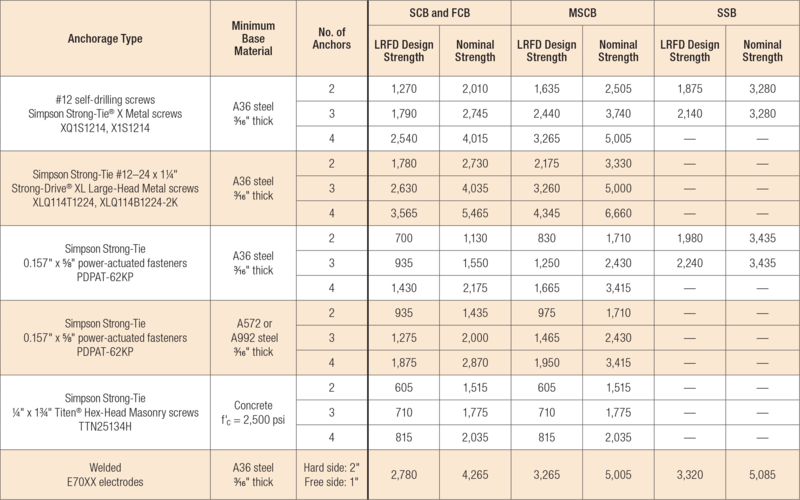 For other anchorage installations, the capacity of the connection system will be the minimum of the tabulated value and the allowable load from the SSB Allowable Anchorage Loads table below. For LRFD design strengths, reference the SCB Service Load Limits, LRFD Design Strengths and Nominal Strengths table below. Allowable loads are for clip anchorage only. The capacity of the connection system will be the minimum of the tabulated value and the allowable load from the SSB Allowable Connector Loads table above. Tabulated values are for the connector and attachment to the stud-wall framing. 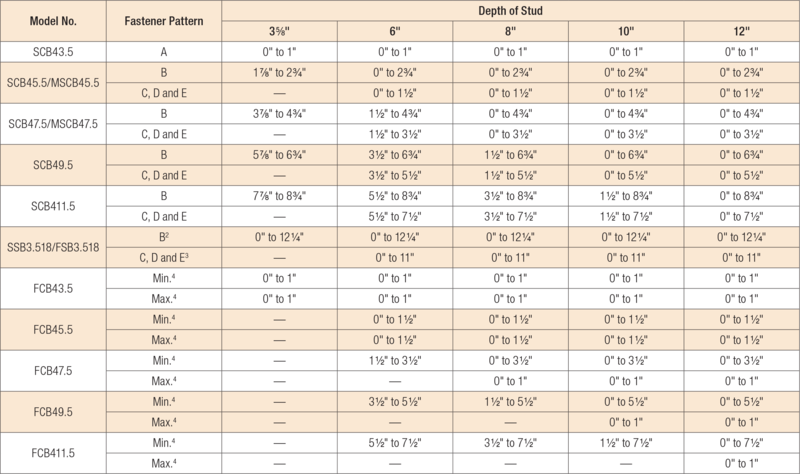 The assembly strengths are the minimum of those listed and the anchorage values listed in the Anchor Values table below. Service Load Limit is the load at 1/8" deflection for use in evaluating the performance under service-level loads. LRFD Design Strength is the Nominal Strength multiplied by a resistance factor, φ.
Nominal Strength is defined in AISI S100-07. Tabulated values are for the anchorage only. The assembly strengths are the minimum of those listed above and the connector capacity and attachment to the stud-wall framing listed in the SSB Service Load Limits, LRFD Design Strengths and Nominal Strengths table above. For the Service Load Limit, use the values listed for the connectors in the SSB Service Load Limits, LRFD Design Strengths and Nominal Strengths table above. The stand-off is the distance from the interior flange of the stud to the face of the supporting structure. All dimensions assume fasteners are installed a minimum of 1/2" from the edge of stud, and the connector does not extend beyond the exterior flange of the stud; "—" designates conditions where fastener pattern will not fit on stud. A tabulated maximum stand-off of 12 1/4" is based on three anchors. For two anchors, maximum stand-off is 13 1/4". A tabulated maximum stand-off of 11" is based on three anchors. For two anchors, maximum stand-off is 12". For FCB fixed connectors, minimum indicates fill all round holes, and maximum indicates fill all round and triangle holes. See fastener patterns in the image gallery. SSB See specific model numbers for code listings.